Tim Cook Visits China to Discuss Market Growth, Low-Cost iPhone with Carriers? According to a Chinese media report [Google translation] pointed out by 9to5Mac, Apple CEO Tim Cook visited China recently, possibly to discuss mobile growth after Apple announced a decline in growth within the market during its recent quarterly conference call. The article also claims that Cook may have met with the Chinese carriers to discuss the impending launch of the heavily rumored low-cost iPhone in the region, potentially named the iPhone 5C. It is speculated that with the previous high-level meetings with China Telecom Cook similar, the two sides level will mainly focus on the issues discussed at the strategic level, may also be involved in co-generation iPhone and sales. Insiders pointed out that China and the Cook high-level talks with China Telecom, may mean that the new generation iPhone will likely be listed in China through China Telecom first sale. It is understood that since Apple CEO Cook served as third visit to China since it is unclear the specific time of Cook's visit and travel arrangements, Cook is expected to be in the next few days, respectively, in China Unicom and China Mobile executives meeting. 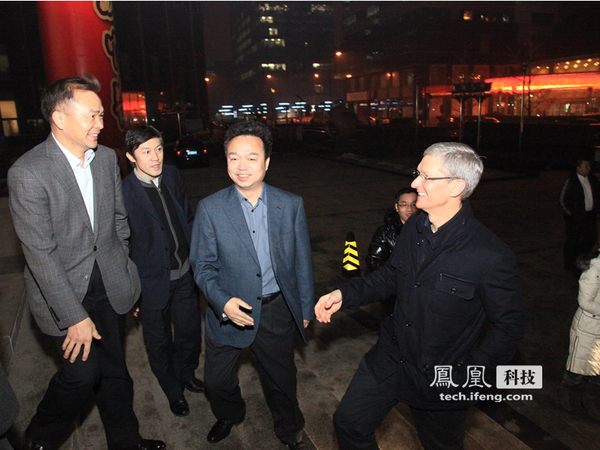 Early January 2013 and mid-March 2012, Apple CEO Cook to the identity of the first visit to China, one after another with the Ministry of Industry executives and China Telecom, China Mobile, China Unicom's top leaders met. Since Cook served as Apple CEO, Apple's emphasis on the Chinese market gradually improved. At present, through China Unicom and China Telecom, Apple covers China's 350 million users. The news of the visit comes after a Chinese labor group alleged poor working conditions at Pegatron, a main Apple supplier in China earlier this week. Earlier this year, Cook visited China to discuss "cooperation" with China Mobile, and also met with various government officials during his prior trip. I love this picture. Are they having a dance party? Hey! Where'd the button go?! China is and will be for a long time, a tremendous area of growth for Apple that they could only benefit from at this point. As much as this does. They have the largest potential for market growth, so yeah, he does, and I would too. This has anything to do with the article how? One of the problems Apple is running into in China is that the people of China are not nearly as materialistic as they are here in the states. It is easy for companies here to create artificial demand for products. That artificial demand is mainly for gadgets. China is predominantly made up of people who only care about getting buy day by day. On the one hand, we see stratospheric savings rates, extreme price sensitivity and aversion to credit card interest payments. On the other, there is the Chinese fixation with luxury goods and a willingness to pay as much as 120% of one's yearly income for a car. It look like article going through translation online. No one has guess.